The Coolest and Most Versatile Camera Ever!!!!!! BUY IT RIGHT HERE!!! I am sooo excited about this particular topic. 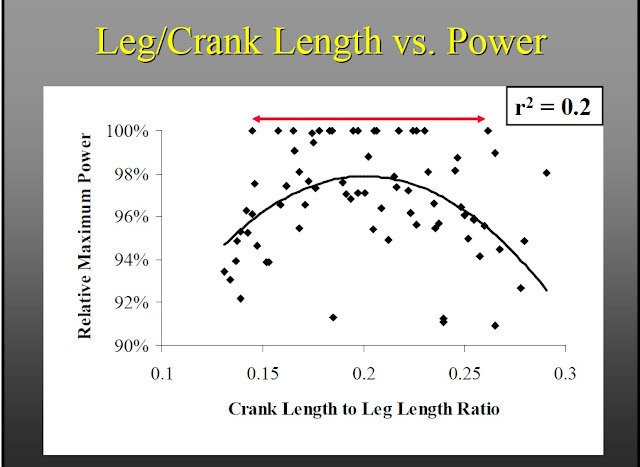 I've been riding for years and I've never been overly confident that I was riding the ideal crank length. After finding this article I am very comfortable with my 172.5mm cranks. Of course there's basically nothing wrong with the other standard crank length sizes either. 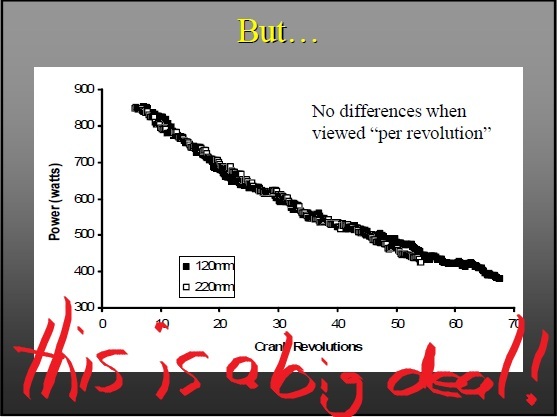 Dr. Martin's data shows that "170 mm cranks would compromise the power of the shortest and tallest riders by AT MOST 0.5%. For example 6 watts out of 1200." 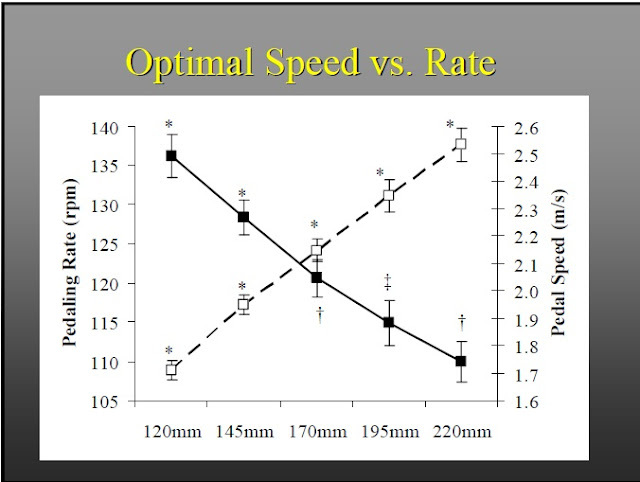 Another important point 120 rpm is close to optimal RPM (or cadence) when sprinting with standard production size cranks. I'm not suggesting that racers observe their cadence when riding, I just want to point out that higher cadences are generally NOT MORE EFFECTIVE. This will become even more apparent with a later point concerning larger gears being better than smaller ones for sprinting. The summary of the above three charts is that 1. effect of crank length is small and significant only at extreme lengths, 2. 170mm cranks will compromise power of the tallest and shortest riders by at most 0.5%, 3. 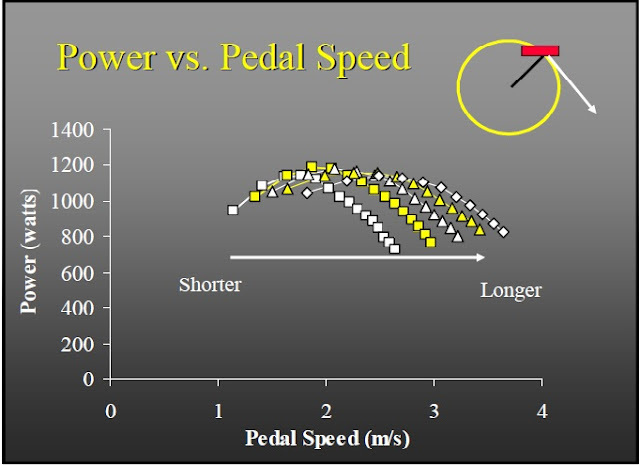 Pedal speed and pedaling rate interactively limit power, and 4th and most importantly: Cyclists can ride the crank length they prefer without concern of decreasing maximal power. The next chart is a biggie. UPDATE: February 5, 2012: The data from the above chart is correct, and has been supported by numerous studies. However, there is more to it and can be found in my article: "The Ideal Cadence for Competitive Cycling"
This is amazing stuff. I've been told countless times to get my cadence up. Generally 90 is often touted as the ideal cadence. 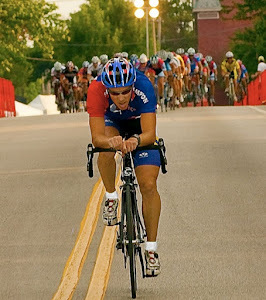 It may still be for speed changes in criterium racing, but I think not for time-trialing. I tend to find myself falling into the upper 70s when time trialing despite trying to remind myself that 90 is better (turns out that it's not necessarily so). I plan on doing more riding with lower rpms and examine my watt data. I know that a lot of cyclists will reject the notion that lower cadences are more efficient than higher cadences. I myself had some initial trouble with it. Generally I have found that my heart rate and wattage will stay fairly constant with different gear/rpm combination from the range of 70 to 90s I have noticed an heartrate upward drift as I go upward into the 90s. The findings of this research are impressive (in my opinion). I contacted Dr. Nate Means (biology professor), Dr. Pam Hinton (exercise physiology), Dr. John Bowders (engineering) all to discuss this research document (powerpoint doc. actually) and try to understand/discuss the findings and implications. Nate has referred me to another scientist, Pam basically agrees with the Dr. Martin and John and I are going to chat more about it tonight while biking. And that's not all! Check out the next three blocks. The summary findings are that the "rate of fatigue was greater when cycling with shorter cranks than longer cranks", and "fatigue per revolution was identical for the two crank lengths". And here's the biggie: "Data suggest that a relatively fixed increment of fatigue occurs with each maximal contraction". In short, this means a bigger gear is better when doing longer sprints. If anyone has doubts just set up some sprint repeats with different gears and look at the data from your SRM or Powertap, etc. The bigger gear will win on the longer sprints. This is cool stuff my friends. Summary: Common crank sizes are nearly all equal in efficiencies. Cranks size can be chosen for reasons such as ground clearance for cornering/obstacles (shorter), aerodynamics (shorter), or rehabilitation/flexibility (longer). Sprinting 120 rpm is best. 60 rpm is better than 100 rpm aerobically (generally lower cadences are more efficient than higher). 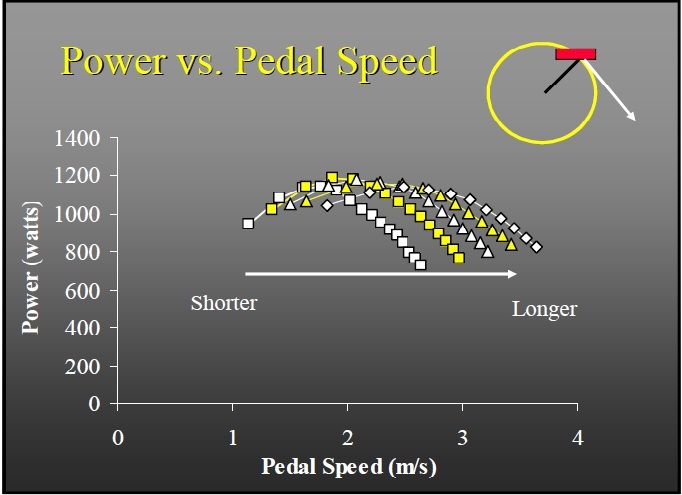 Natural pedal stroke is best (do not pull up), crank length has no effect on fatigue, no effect on metabolic efficiencies and very small effect on maximum power. A big gear sprint is better than a small gear sprint (for 30seconds) . To learn about the best video camera in the world for videoing cycling (which is the cameras that I use for my videos) click here. I have received some concern that lower cadences aren't so good. In fact, racing tends to have higher cadences. So if lower cadences are so great, why aren't racers using them? So here's my thoughts on the rpm question: the ppt that I used wasn't specifically focusing on rpm, but did provide a graph that showed better efficiency at 60rpm vs 100rpm. Who knows, 90 could be almost the same as 60rpm and then a big fall in efficiency occurs after that. From my own experience this is the case. 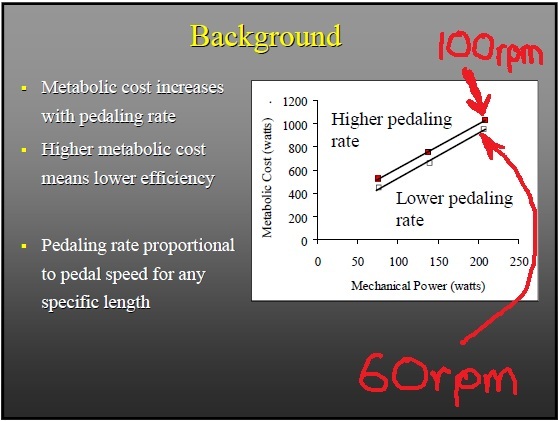 I questioned Dr. Martin on this and he replied that, "The effect of pedaling rate on metabolic cost is pretty well established. Heart rate generally tracks well with met cost but its not the same thing. Also, there is individual variability in responses so you may be a bit different than the mean." I have noticed (and you probably as well) that almost everyone drops cadence during climbing (sometimes in the 60-80rpm) and almost all new riders tend to ride at lower cadences until they are scolded to "spin" because "it's more efficient". Well, Dr. Martin's data (and others) says that's not necessarily true. He does state (his data shows) that 120rpm is generally best for maximum wattage. 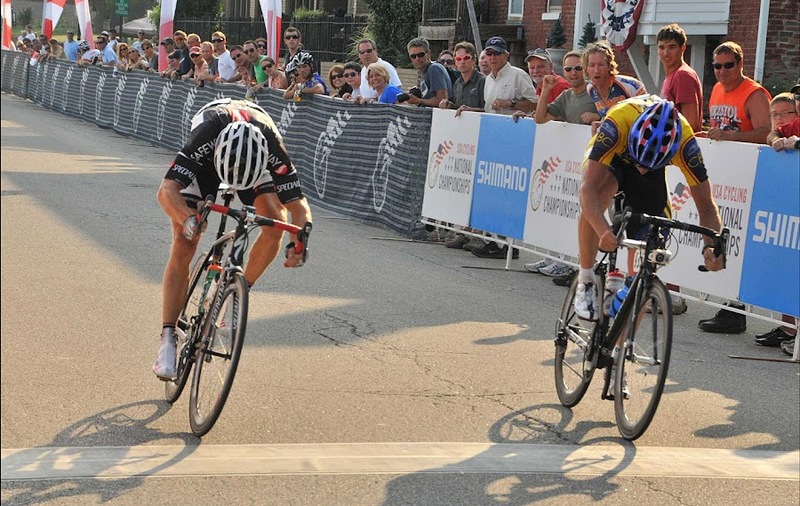 I think crit racing requires higher cadence in order to accelerate out of corners, stay on wheels and in the draft and of course to sprint. Being efficient is pointless when you are getting dropped off the back or smoked in a sprint. My cadence in the state time trial was 76rpm. In the state crit it was 54.6 rpm (that's with all of the zeros averaged in when not pedaling), and 56.1 rpm at the National crit. Again it's unusually low because of all of the zeros. In both races I was on/off, on/off a lot. When I would pedal often the cadence would be upper 90s, and sometimes 110. I definitely wouldn't say my pedaling was extremely efficient, but it made me more efficient by allowing me to draft and not pedal quite a bit. If I can find honest scientific data showing cadence efficiencies, I will certainly share it! I could be miss=reading things. He mentions a number of crank lengths in one section and then has a chart for just two extreme lengths. He has a plot with extreme crank lengths but no "average" crank length of 175. 2 inches longer or shorter than normal, at least for me who rides with 175 mm cranks. That might be similar to saying seat height does not matter when they do tests with the seat 2 inches lower or higher than your normal and do not include your normal. He has a chart that shows a 1.6% variability and later discounts that as not significant. 1.6% of 25 mph is .4 mph. That is significant. Regarding cadence adding in your zeros does not really give a lot of info. Sure it shows you coasted which is good but it does not tell what you were doing when you were working. What was your normalized cadence? I suspect there is a reason why some folks developed normalized power concept to illustrate what power you are making when you are actually making power. Early in the morning. Not reading the whole article but glancing at the summary pages might suggest there is some good info in there but conclusions are suspect, especially if he indeed does not include a rider's normal crank length. bgb: Thanks for posting. You have valuable questions/points. Dr. Martin sites at least 4 different scientific studies in the power-point presentation that I cite in this blog. 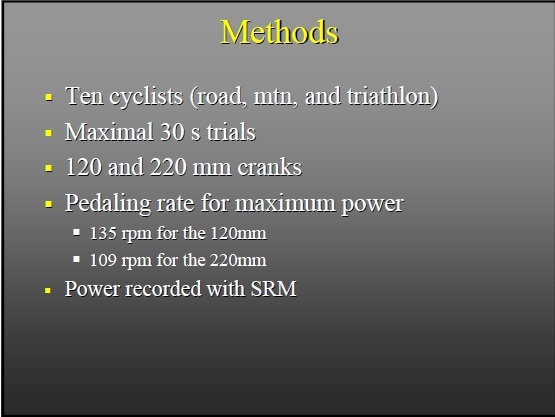 He says that in his test he used 16 trained cyclists performing maximally with 120, 145, 170, 195, and 220mm cranks. He also did statistical analysis for leg, thigh & tibia length to crank length ratios for power results. 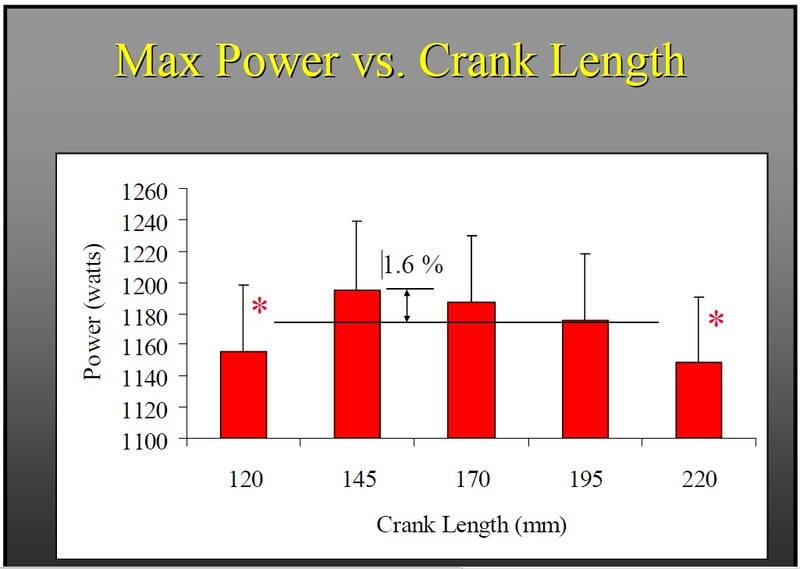 The conclusion was that 170mm cranks would compromise the power of the shortest and tallest riders by AT MOST 0.5% or for example 6 watts out of 1200. You referenced the 1.6%variation between 145mm and 195mm cranks (both are non-standard sized cranks and are basically extreme lengths). Again the 170s are the answer. But so is 172.5 and 175. And lastly concerning cadence: I listed my cadence numbers only to illustrate 2 points. One my average time trialing cadence (76) was lower than the supposed and highly touted "efficient" 90 or even 100 for Lance himself. Dr. Martin and other Scientists have found that lower cadences are more efficient than higher (example 60rpm vs 100rpm). Efficient meaning, that less calories or engery is used at a given workload or effort. I list my low average criterium rpms (low because of averaging in zeros) to illustrate that crits are not smooth in efforts and are very on/off which is normally not efficient, but IS efficient in crits because of drafting. As we all know drafting is extremely efficient vs not drafting (ball park 30% less energy). In short your point about normalized data is valuable especially when in full context of all factors/data. As a final note: I plan on conducting my own analysis of cadence efficiencies using my SRM, watt data, heart rate, fixed cadences at different wattages. My SRM software will graph/plot out the data into a Conconi test. Heart rate generally tracks very well with efficiency, so the cadence plot line with the lowest heartrate plotted to watts should be the most efficient cadence for me personally. Should be interesting. The following post discusses the Conconi method. I saw that you say "natural pedal stroke (do not pull up)" but I've always read and been told to "pedal circles". I always interpreted that as "pulling up", at least a bit. Are they mutually exclusive or am I just misunderstanding a fairly generic term? King Tomato: "pulling up is significantly less efficient than pdaling with your own intuitive preferred technique. Data suggest that muscles that flex the leg are intrinsically less efficient". Efficient means less calories or energy required to produce the same watts or speed. Using muscles in the back of the leg for pulling will produce more watts and speed, but is less efficient than just pushing harder with the "intuitive preferred technique"
I personally use the "Lemond Method" of pulling my foot backwards at the bottom of the pedal stroke. The sensation is similar to wiping mud off your shoes onto a mat. Science data tends to suggest that this is inefficient. That may be true, but I am also producing more watts and speed. Often performance must be traded for efficiency. Especially in cases of bridging gaps, breaking away, sprinting, accelerating, etc. In time-trialing I need to study if my pedal technique is indeed more helpful or more efficient. 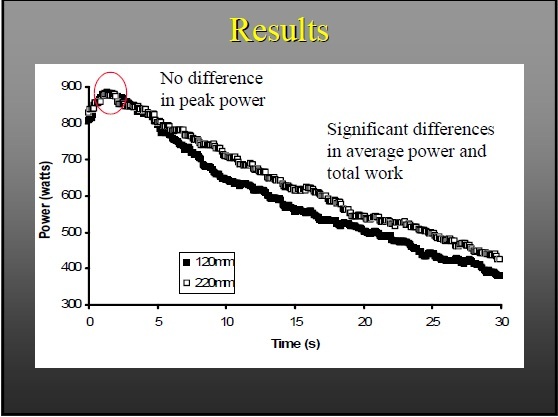 This can be examined by studying watt/heartrate with controlled pedal strokes on a stationary trainer. I've read that most cyclists are around 24% and elite cyclists tend to be less efficient but have such high aerobic capacity that they are still far more productive than higher efficient less gifted athletes. I think the ability to produce maximal watts for longer periods is going to be more valuable for racing than being strictly efficient. I wish I had more science to support this. I did see a summary that higher cadences leads to efficiency drop to around 20%, but if this drop increases a riders speed to stay in the draft of other riders it will make that rider much more efficient overall. I hope this helps. It is a little complicated. Yep, it definitely does help and confirms a lot of what I've learned through my own limited experience training/racing this year. I read the Lemond "dog poo" method a while back and realized I seem to do that naturally. Any deliberate attempt to change my stroke may increase my MPH for a bit (I don't have a power meter) but often leads to fatigue, cramping, etc. when done longer. Anyway, hope you're racing in the STL next weekend. I am only in the CAT4 races but am course marshaling the "big" races and will be cheering you on if so. Someone referred me to this article and I like it a lot. At 54, a significant issue for me is arthritic knee pain. I find less pressure leads me to higher cadences, but apparently I am lowering my efficiency to "baby" my knees. Steve: You are one hundred percent correct. My friend Thomas (physiology grad student) told me: "I've been meaning to tell you that economy, when selecting cadence, isn't the only factor to think about. (Inter-segmental) Joint moments, specifically of the knee (and more importantly the patella) are something every cyclist needs to take into account." Additionally you may not be giving up a lot of efficiency. A normal range is from 17-24% and 24% efficiency is often used for estimating calorie consumption from measured watt output. The fact still remains that lower cadences are generally more efficient than higher ones. It is a myth that spinning a high cadence is more efficient than lower cadences as indicated by the graph in this blog. This is supported by real data and not opinion. Very interesting article. I have been considering 165mm cranks due to knee pain with longer cranks, but have not made the switch since I read online that smaller cranks make it harder to go uphill. Do you have any experience or information if that is true? Daniel, First check your position. See: http://myworldfromabicycle.blogspot.com/2010/05/lemonds-sizing-chart.html This will get you in the ballpark correct. Next check your cleat alignment. You may benefit from some float. Lower cadences may be more efficient, but can be stressful on some knees and riders not adapted to lower cadences. Probably best to ride 80-90rpm in your case. My own perceived observation is that a 175mm crank seemed to climb better when standing than a 170mm crank did. I will tell you that standing (fine for short bursts, but not time-trialing) produces more power, but less efficiency than seated. When seated a smaller gear will make it easier to go up hill far far far more than the differences of crank length. And as a final note, the science shows that you can pick a crank length without concern for efficiency loss. Hope this helps. Tell me if it doesn't and I'll investigate for other solutions for knee pain concerning bicycling. I just came across this site. Very interesting! I recently removed the house brand 50/34 compact crankset with 175 mm cranks that came with my bike and upgraded to DA 53/39 with 175s. In a triathlon the following weekend, the hills nearly killed me! I just couldn't seem to get a low-enough gear to maintain a comfortable RPM. Now I'm wondering (and especially given that I'm 6'3"): should I move to a 177.5 mm crank? I'll try the sizing chart but I need to decide soon as I know a guy who is currently selling DA 177.5s for an excellent price. Any other suggestions? Ron: First try a new cassette with smaller gears (larger cogs). I just added a link to a gear calculator to this blog (on the right side). It can be found under "Links to People and Things That I Like" as "Gear Calculator". 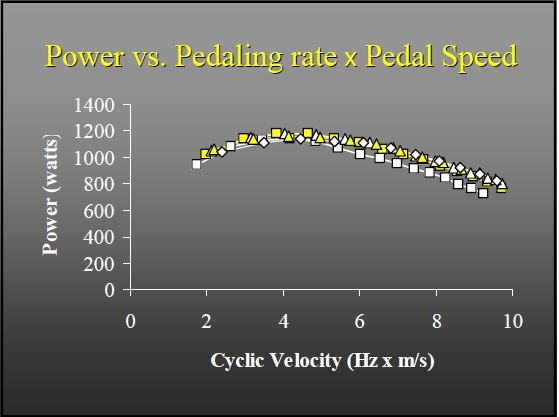 I discuss the variables that effects our velocity on a bike and road grade combined with weight is a biggie. I have graphic illustrations of the effects of hills as well as a link to a bike velocity calculator that will give a good estimate of the variables related to such. Thanks very much, David. As I did replace the cassette and the chain, I will check and see if the cassette size is smaller, overall, than the Pina house brand I removed. As I reviewed the graphs and research, I'm wondering if there be any benefit, from your perspective, of going to this longer crank? The friend from whom I purchased the DA thought that I should be able to generate more power, but I'm very concerned that I won't have any legs left for the triathlon run portion! In your opinion, which option will make it easier for me to run afterward in term of not taxing my muscles? Short answer for your friend concerning the increased torque (function of power) of longer cranks is that it is negated by gear combinations. Thanks so much for your informed advice. I'm a details guy, as well, so I absolutely love your science-based site and have placed it on my Favorites list. Keep up the great work! ok, i always wonder about cycling tests, data, and interpretation and conclusions. it seems to me they treat the body as something that doesn't adapt...or perhaps they don't consider, the body's physical adaptation propensity or possibilities when they interpolate (perhaps not the best, or even correct word, but i like the fact that it came to me and i'm runnin w/ it) the data. is it not true that i can try to develop new techniques, and adapt strange new, dare i quest, better, proficiencies, that simply run amock over static boy's game theory? naturally, you wanna lock the core down with a a steady firm pull inward as you engage teh climb forthwithly, but i mix it up, but pushing forward on the tops, sometimes alternating left and right and right inversely to my pedal stroke, sometimes in synch with my pedal stroke, and i get stronger at this technique, over time...then i alternate all 3 during the climb to stay seated with mixed freshness. and the leg grows...in conclusio just because things are one way, doesn't mean they can't be different...especially when half the equation is adaptable. Ed, double knees and riding until blistering! You're a tough dude! I have a couple ideas. First, you definitely shouldn't be rocking in the saddle. Normally this is from a saddle height that is too high. First recheck your saddle height using the saddle height chart here: http://myworldfromabicycle.blogspot.com/2010/05/lemonds-sizing-chart.html. 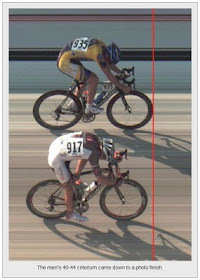 Your saddle height should not be higher than this chart. Your case is special because of the double knee replacements and you may require a lower saddle height because of your reduced range of motion (as you described). I suggest experimenting with your saddle height until your "rocking in the saddle" is eliminated. Also you probably need more physical therapy to increase your range of motion. Definitely keep experimenting, but first check saddle height, then see physical therapist (gotta work on that range of motion), then lower saddle until rocking is eliminated. Hope this helps and your riding becomes pain free! Ed, your leg/knee inflexibility sounds pretty harsh. A smaller crank arm does make some sense in this case (combined with small gearing). I think it is critical that you have continued daily and unending physical therapy (you may already, I don't know). If you are not making improvements with your current physical therapist seek out 2-3 others. There may be some ideas and techniques to help you that have not been presented to you as of yet. It's cool to see someone using actual, replicable, observation-based measurable science to answer these questions. Thank you. Huey, thanks for posting that link. It's a clever and affordable design for changing crank length and hopefully can help Ed ride more comfortably. I did find another company: http://www.hscycle.com/Pages/adjustablecrankset.html. Their cranks are much more expensive ($550) than the swing-arm crank. My only apprehension on the swing-arm is that I can not see (not illustrated) the mechanism for securing the angle. @William: I completely agree with your closing point and only wish that results of scientific research were more public...... like a wiki-research results site. David, the angle is not fixed. The pedal describes a small circle around the pivot (as that section of crank is shorter than a standard crank), but in use, that end of the crank will generally hang down (force of the foot on top). Coupled with the other section of crank, this allows the foot to describe that small circle (like having shorter cranks), but lower down, so bending the knee is not an issue as it is kept much straighter - ideal for those who can't bend their knees fully at the top of the pedal stroke. One thing I am not certain of is if two such crankarms can be used together - though I don't see why not, it would probably make the feet feel a little 'free' though. Good Luck Ed! I've been suffering from chronic lower back pain, so apropos of one of your online articles, I thought I'd ask a few questions. * I'm wondering whether someone with my inseam (75-77cm give or take) might benefit from cranks around 165mm. (I'm 5'7".) Is that correct? I currently ride a Kona PhD with 175mm cranks. Would changing the cranks make a significant difference? * Also, for some time I've been experiencing chronic lower back pain after rides that include steep hills. My typical ride is about 85km. I previously rode a Bianchi Torino and never, ever had any pain whatsoever. On my Kona, the rear cassette is different, so the gear ratios would make climbing more difficult. However, no matter how many times I've been fitted, and no matter how many times I've adjusted the stems and seat height, I cannot get rid of the lower back pain. Might one solution be to replace my flat bars with drops that would allow me to coast in a low position, while riding the upper bars on hills? Would it make sense to convert the bike? Or shall I focus on core strengthening, technique, or something else? Please help. I'm starting to feel desperate! Anonymous: Duplicate your Bianchi Torino's gearing, and bike position onto your Kona and your problem will be solved (these are both important). The crank length will probably not make a big difference, make that your last change. First check your frame size and saddle height with the Greg Lemond frame size and saddle size chart. Also it is completely advisable to stretch on the bike and climb hills in a high seated position. If you were a professional rider, I wouldn't suggest riding full upright, but unless you are riding at speeds over 12mph up hill go for comfort and enjoy. ly put the short crank on and give no time for adaptatio , no gesr chamges, amd no seat position change...welll Of course it doesnt work. Amd Jim was mostly right but he didnt know positions, very few if any did. Yes i do. Im not bragg8ng, i just did far more than any i have seen. Oddly your co clusions in actual practice will not yield correct results if your looking for what is bedt. Try this one tooth smaller in front ring for every 2.5mm shorter. Rpms are powerpulses. How many power pulses at 60 bs 120? Ill give you a hink...part of your logic fails here. I changed out my 52-42-30 triple 172.5mm, for 175mm. I definitely notice I don't spin up as fast, and therefore I have to downshift more. But I suspect I'll get used to it. BUY THE BEST HIGH DEFINITION VIDEO CAMERA FOR BICYCLES. Bike safe, my survival tactics for road cycling.